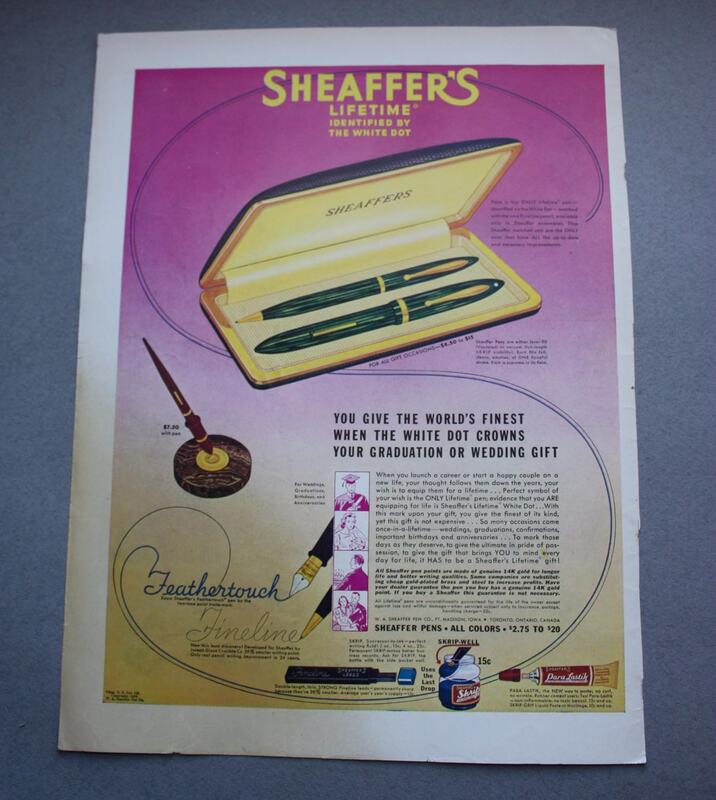 This 1939 Life Magazine advertisement for Sheaffer's Lifetime (White Dot) fountain pen is from the week of May 29, 1939. 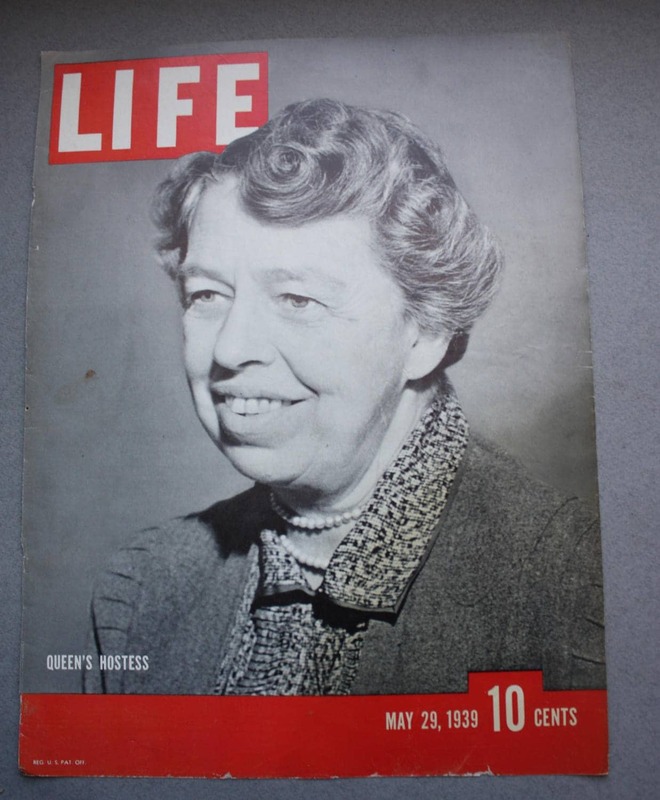 On the reverse side of the ad, the actual cover for the magazine, there is a photograph of a smiling Eleanor Roosevelt with the caption/title "Queen's Hostess." 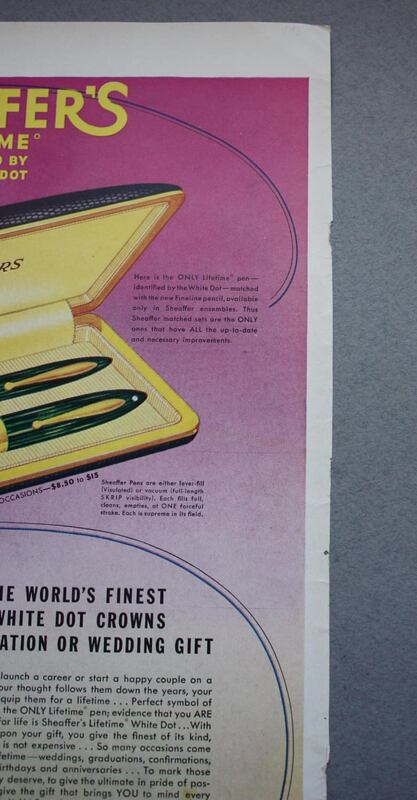 The page has some condition issues, as seen around the ad's edges in the photographs, but these edge issues do not affect the visual quality of the ad itself, and a frame and mat would hide these imperfections. 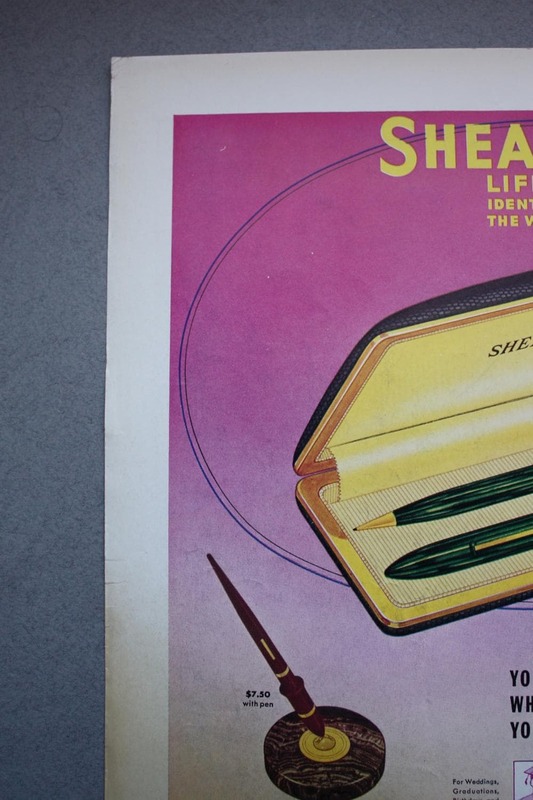 Dimensions are 14" x 10.5". New York State residents, please read this concerning the collection of state taxes. As a New York state based business, I must comply with legal requirements to collect a sales tax from any resident of the state of New York who is purchasing anything from my shop. Because of the variation in sales tax throughout of the state, I am charging a flat rate of 8.875% on purchases made by residents of New York state. I try to offer a variety of shipping options. If an item weighs over one pound, it must go Priority, unless you prefer Ground. Media Mail is often used for books, especially the heavier ones. An upgrade from First Class to Priority is available as well, and special services such as overnight or next day are available upon request. If you've overpaid by $1.00 or more in shipping fees, the difference you've overpaid will be refunded to you promptly upon shipment of your item(s). I do ship internationally. If you don't see postage for your country listed, please contact me. I do not ship to third party shipping companies. Please know that if you have something shipped to a third party shipping company without my knowledge, the item is not insured or covered for any loss or damage. I'll be happy to ship anywhere in the world. Just ask! If you're unhappy with your purchased item, you may return it for a refund of the purchase price of the item. Please contact me within three days of the delivery of your item. You have seven days from the delivery of your item to ship it back. Upon the item's return, I will issue a refund for the purchase price of the item to the buyer as long as the item is in the condition in which it was when it left my shop. Buyer satisfaction is my #1 priority so if there's a problem, please let me know what I can do to make things right.